Employees are the heart of a company. Whether your team is made up of two people or twenty people, the benefits of happy employees are invaluable. In a recent article from Forbes, "79 percent of people who quit their jobs cite ‘lack of appreciation’ as their reason for leaving." The most important investment you will make is investing in your employees. Team building allows you to establish a deeper level of communication with your employees. It is crucial to provide an environment where everyone feels comfortable. Typical team building activities are often times competitive in nature (like bowling or sports) and can add to employee stress levels—which is the exact opposite result you are hoping to achieve. Pinot’s Palette is unlike those stress-inducing team building activities where no one wants to participate, or are afraid to “lose.” Instead, they will enjoy a relaxed environment of painting and expressing their creativity and not focusing on competing, but rather having fun. You will see your employees working together in a different way that you wouldn't normally be able to see around the office, and even from different departments. Bring multiple departments together because the accounting team doesn’t normally get to interact with the people in marketing. Building cross-departmental relationships will support team work and communication back in the office. They will have the chance to interact with their coworkers while doing something fun and creating memories in a relaxed environment. 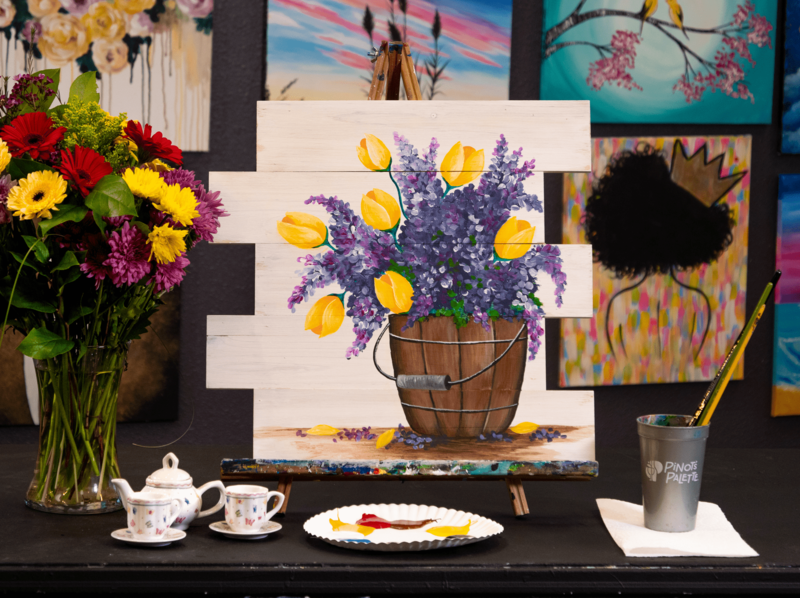 Offer them a chance at painting at a creativity-inducing studio where they can bring out their inner Picasso—creating their own masterpiece while listening to great music enjoying their coworkers and bosses outside the office. Watch your team work together, or get advice from a teammate to add something to their painting. You will have insight to individual strengths that perhaps you where not aware of. Shared memories outside of the office and increasing personal rapport will strengthen communication and benefit the whole team. All work and no fun in a workplace is not enjoyable for anyone. When things get tough at work they will know you care, and that they are appreciated. Investing in team building is an investment in long term employee retention and positive company culture. Wood palette signs are on trend for this year, and we couldn't be happier. Your employees will love being able to paint something that is personal to them while adding a little rustic charm to their home. *Not available in all studios. Check with your local studio for this product availability. Share Book a Team Building Event!